The white semi-gloss SG-40 roll material is an all around winner, used in almost any application. It's dependable, permanent adhesive is perfect for machine applied runs, and it's priced great for any volume. The beautiful glossy finish is available with our without lamination. 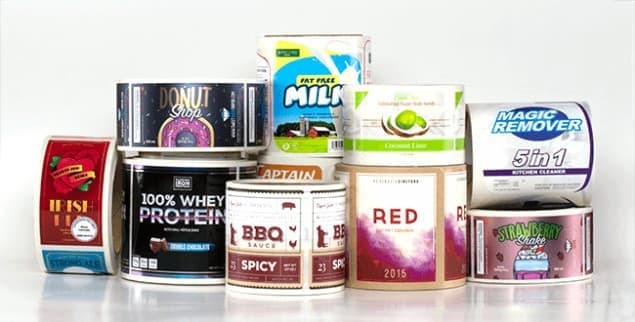 Not only will this label look beautiful with our cutting-edge UV digitally printed surface, but it's strong pliability will allow for rugged storage and transport so they can be ready to jump off the shelves! Need help? No problem, our experts are here! Looking for a different material? Click here to show all roll label materials. Your order will ship 4 business days after your proof approval! Your order will ship 2 business days after your proof approval! Your order will ship 1 business days after your proof approval! Choose your printing time below to see when your labels will ship. Don't forget to keep in mind that your printing time doesn't start until you've approved your proof. You can choose how fast your labels will be shipped during checkout.